The silver price approached $50 an ounce and then fell back dramatically indicating that there could be future fireworks sparking. Read more in this full post by The Mess That Greenspan Made. 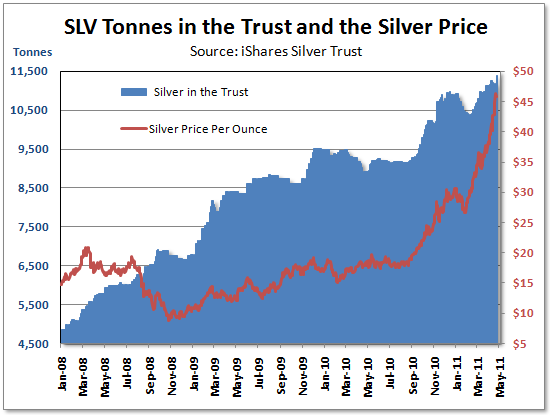 Let’s see… Trading volume for the iShares Silver Trust ETF (NYSE:SLV) reached a stunning 189 million shares yesterday (seven times that of the QQQ ETF) and options trading reached similar lofty heights as the silver price approached $50 an ounce and then fell back, all in dramatic fashion. After hours it was disclosed that the “tonnes in the trust” at SLV reached a new record high at 11,390 tonnes after a massive 240 tonne addition. It could be another interesting day ahead for the metal. Then again, markets may want to rest up a bit before tomorrow’s big press conference with Fed Chief Ben Bernanke, after which there may be some even bigger fireworks. This article was republished with permission from The Mess That Greenspan Made.